If you love horror, monsters, science, mystery, you will enjoy this book. I will let you know right now, I loved this book. This book made me laugh, cry, and generally fall in love with all the characters (well, minus the super bads). 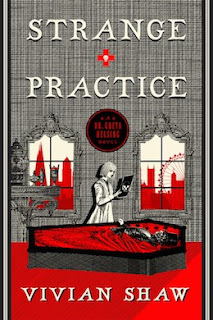 Dr. Greta Helsing, a descendant of the famous Professor Abraham Van Helsing, is living in modern day London following in her father's footsteps. After medical school, Greta joined her father's practice, taking over after his passing. However, this isn't just any medical practice, Greta treats all manner of the otherworldly, from vampires and vampyres to mummies and ghouls. A firm believer that all persons, including the undead, should receive respect and properly medical care. When a vicious attack on a vampyre friend of one of Greta's patients appears connected to the serial murders occurring in London, Greta, and her friends end up squarely in the sights of an evil unlike anything they've seen. Shaw clearly did her research when it comes to undead history and tales. There are so many references fans of horror will truly love and respect. It adds a richness to the text and an authority to the voice behind each character. Many times urban lore surrounding a certain undead will be openly addressed during conversations yet never felt forced into the narrative. Weaving such history into the story itself allows Shaw to make her Helsing tale wholly her own. The attacks and murders lead into a pretty straight forward mystery where Greta and her companions start unraveling clues Scotland Yard is not privvy to since the undead are a bit harder to kill and become a witness to the crime versus victim. Greta is driven to solve the murders in order to protect those closest to her. The undead can't afford a lot of police and investigations poking around. She fears the worst from abductions for experimental probing to the pitch fork brigades. Protecting her patients and friends is of the utmost importance to her, and it is a credit to Shaw's skill that I was right there alongside Greta wanting to protect everyone. It takes a bit to make me cry at a book, Black Beauty and Where the Red Fern Grows managed it and now I can add this one to the list as well. It wasn't because of a tragic thing (to avoid spoilers that is all I will say) it was because there is a moment when Greta is so upset she is a slobbering, sobbing mess and I was so invested in these characters I found myself tearing up and having to blow my nose, once again, right alongside Greta. It is that kind of character-building that will carry this series for as long as Shaw wishes to write it. As soon as I finished the book I went looking to see if I could at least pre-order the next in the series, sadly it isn't listed yet. Every time I think I am firmly in the the "I prefer standalones always and forever" a book like this will come along and sweep me away selling me on the idea of series and spending more time with characters. If you love horror, monsters, science, mystery, you will enjoy this book. If you are like me, you will keep checking Orbit's listings to see when the second is on the horizon and available for pre-order. Nerd Coefficient: 9/10 - A seriously great cast I look forward to following for many, many books!